#TERRORISM #WestAfrica #Togo #Nigeria Jabhat Fath Al-Sham (Al-Nosra) friends of #Gnassingbé create Instability increasing in North Africa, Sahel as global militancy rises ! Togo, for several years, is a significant contributor to the multinational forces of the United Nations for the maintenance of peace. However, an almost unnoticed event raises questions about the sincerity of our commitments to the international community. This event concerns Faide Gnassingbe’s impromptu visit in 2016 to the wounded of Jabhat Al Nosra (now known as Jabhat Fath Al-Sham), a branch of Syrian rebels allied with Al Qaeda and treated at Ziv Hospital in Israel. One can legitimately ask the question of the diplomatic or security purpose of this visit to wounded without a real identity, some of whom are suspected to be Daesh soldiers. Can we not be tempted to see in this unexpected visit to the wounded of Jabhat Al Nosra some form of allegiance to the terrorist Caliphate Daesh, the ideological and financial godfather of the Boko Haram sect operating in Nigeria, in order to obtain from the latter a commitment not to disrupt the Maritime Safety Summit scheduled to take place a few weeks later in Lome? Would our Niamtougou Airport be used to transport jihadists and weapons to northern Nigeria? This is not just a question of intellectual speculation, but of a serious matter concerning the security of our country, the West African subregion and the world. When a Head of State is going to bring his moral support, his compassion and perhaps the material or financial help to soldiers of terrorist organizations, our national community and beyond it all the international community must ask him to explain the objectives and also the results of this unusual and incomprehensible approach. Nearly 12 000 destabilising events were recorded in North Africa and the Sahel in 2016, an increase in 16% compared to the previous year, while the number of attacks around the world from terrorism and insurgency rose dramatically compared to 2015, with 24 000 attacks in 2016. According to new information from MEA Risk LLC, the North Africa and Sahel zone witnessed a 16.0% increase in the number of destabilizing critical incidents in 2016 to a total of 11 916. “Despite such increase, MEA Risk’s Instability Index, measuring the crisis intensity for the region, dropped 15.2% as a result of lesser terrorism-related incidents and a shift to less deadly forms of critical incidents,” the company said. “But the Instability Index still remains elevated, putting the region in the low-end of the Severe/High-Risk Zone. The death toll from critical incidents for the region fell by 37% year over year to settle at 8 511, as violence in some areas subsided a bit as a result of more proactive military and law enforcement engagements to reduce terror acts. 2016 data collected by MEA Risk shows that Libya remains North Africa’s most unstable country. Elsewhere, despite an improvement, Egypt was ranked the second most unstable due to violence, general and labour unrest and broad political tension, compounded by an economic crisis. Looking forward, “there is a strong likelihood of a resumption of terror activity in 2017 owing to the return to their home countries of North Africa militants who have been fighting in Syria and within Libya,” says Arezki Daoud, MEA Risk Analyst. “Countries of the region will also be confronted with bigger governance, economic, environmental and social issues, which will mean a continuation, and a possible increase in the overall instability rating,” said Hakim Briki, head of North Africa research. In a separate study, IHS Markit noted that there were 18 987 terror and insurgency attacks globally in 2015 compared to 24 202 attacks in 2016, marking a 25% increase. “In 2016, there was a notable rise in the number of attacks compared to 2015,” said Matthew Henman, Head of the IHS Jane’s Terrorism and Insurgency Centre (JTIC). “We saw more lower-level asymmetric attacks this past year and increases in longer-term conflict zones like eastern Ukraine. JTIC compiles figures for the annual Global Attack Index using open source data. The latest report noted that Syria and Iraq account for 45 percent of all attacks worldwide, with 7 497 attacks taking place in Syria and 3 350 in Iraq. The Islamic State accounted for almost 18 percent of all recorded attacks worldwide and 39 percent of all non-militant fatalities. The intensification of insurgencies in Yemen and Turkey led to increases in the recorded number of attacks of 76 percent and 110 percent, respectively. As in the past two years, the Islamic State was the most operationally active, non-state armed group tracked by JTIC. The Islamic State conducted 4 236 attacks, which resulted in 10 807 non-militant fatalities. “While both figures represent only what could be definitively attributed to the group in open sources, and are likely far lower than the true total, the Islamic State accounted for 18 percent of all recorded attacks worldwide and 39 percent of all non-militant fatalities,” the report said. While the Islamic State is almost certain to lose what remains of its territorial holdings in Iraq and Syria across the course of 2017, it will likely look to offset this with further creations of affiliates, the report said. “In 2017, the threat posed by Jabhat Fath al-Sham, formerly Jabhat al-Nusra, will likely capture more and more headlines,” Henman said. “The group poses a potentially longer-term and equally serious threat as the Islamic State.” In 2016, 687 attacks were claimed by or attributed to Jabhat Fath al-Sham, a 20 percent increase from 2015. A priority for the group in the coming months is a merger of opposition groups in Syria, which will enable it to further extend its reach and control within opposition areas. 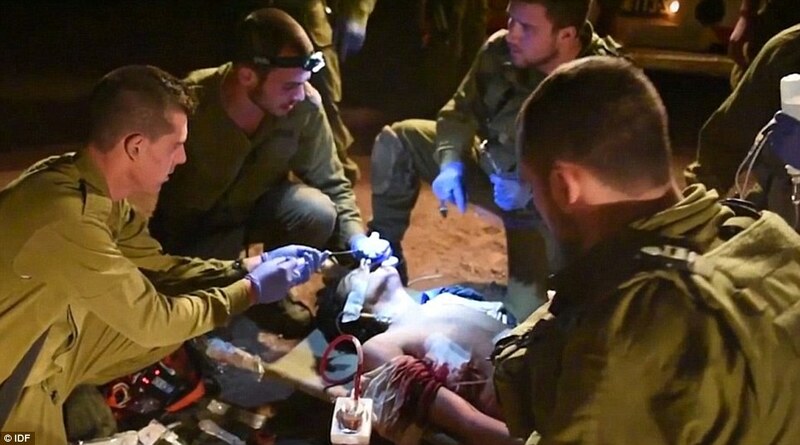 Saving their sworn enemy: Heartstopping footage shows Israeli commandos rescuing wounded men from Syrian warzone – but WHY are they risking their lives for Islamic militants? Baka Lassidali with General Kadangha and Laokpessi helped by formed French General Germanos with Benjamain Yeatan from Liberia and some foreign secret services using technics of Counter-Insurgency against Togolese People. Counter-insurgency is normally conducted as a combination of conventional military operations and other means, such as demoralization in the form of propaganda, psy-ops, and assassinations. Counter-insurgency operations include many different facets: military, paramilitary, political, economic, psychological, and civic actions taken to defeat insurgency. In The Insurgent Archipelago John Mackinlay puts forward the concept of an evolution of insurgency from the Maoist paradigm of the golden age of insurgency to the global insurgency of the start of the 21st-century. He defines this distinction as ‘Maoist’ and ‘post-Maoist’ insurgency. The casualty – who doesn’t look older than 20 – is losing blood fast. 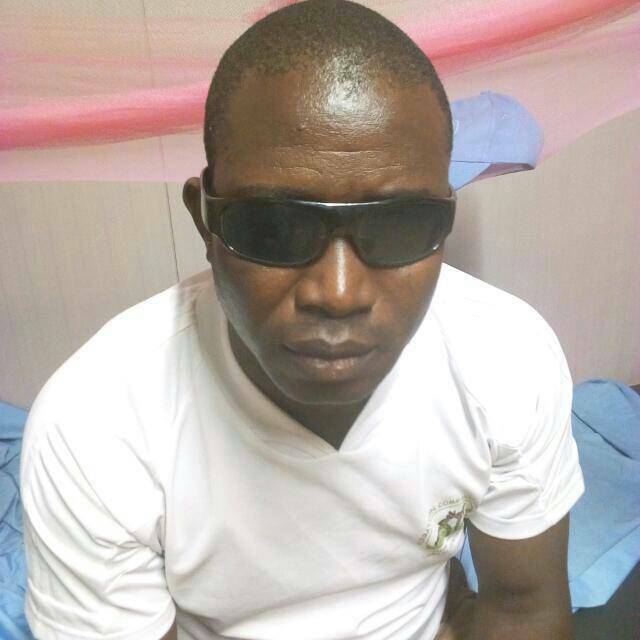 He has been shot in the intestines and the liver, and has a deep laceration in his left ankle. 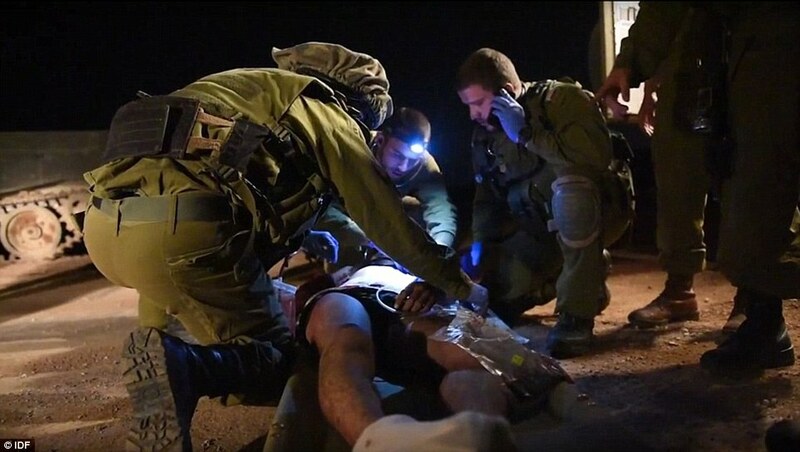 After putting him on an emergency drip, the commandos stretcher him back to the armoured car and head back to Israel. 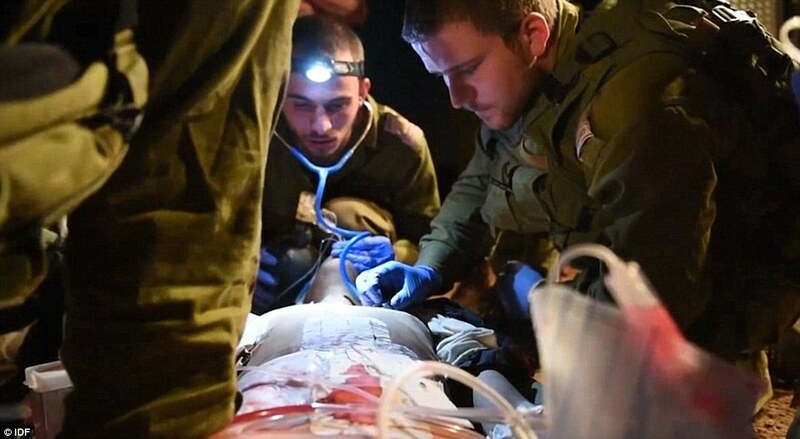 ‘My dream is that one day, the Red Cross will say, thanks guys, we’ll take it from here, you go back to your unit and take care of injured Israelis,’ said Lieutenant Colonel Itzik Malka, commander of the medical branch of the Golan Brigade. Almost nothing is known about the Syrian as he is wheeled into emergency surgery 40 minutes after the rescue. He may be a member of a relatively moderate Islamist group, or he may be a jihadi. For its part, Israel says it either does not gather, or does not disclose, this information. Officially, Israel says that this operation is part of its programme of humanitarianism, which has provided aid to a long list of countries from Haiti to Nepal. Palestinian civilians are also regular patients at Israeli hospitals such as the Rambam Medical Centre in Haifa. 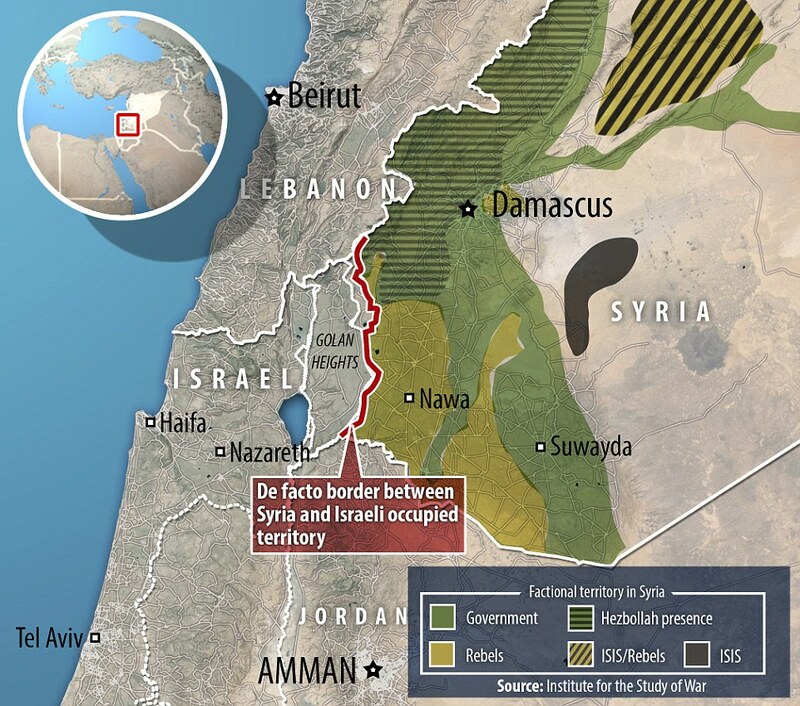 A spokesman pointed out that about 20 per cent of the Syrians treated by Israel are civilians. 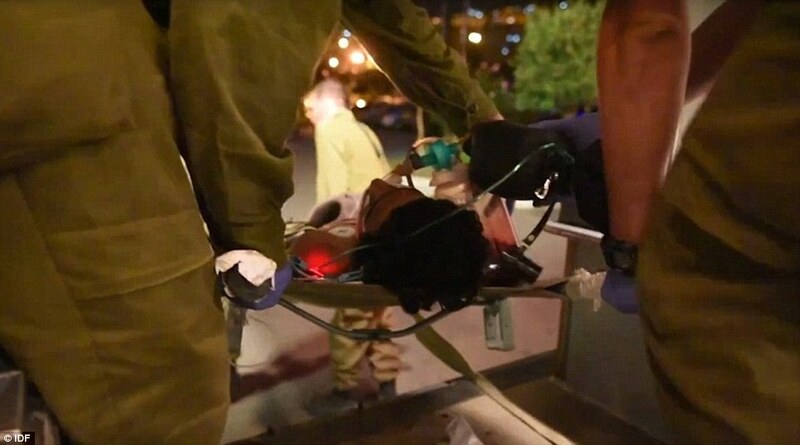 MailOnline witnessed Israeli army medics treating a sick two-month-old baby and a middle-aged man who had suffered a heart attack, both of whom were evacuated across the Syrian border by the commandos. The rescue of the baby girl was particularly poignant. Her older brother had died of a rare bone disease, and her mother feared that she was showing symptoms of the same disorder. Distraught, the woman decided to brave the dangers of the border and appeal to the enemy for help. The baby was treated under cover of darkness in the back of an armoured car, by Israeli military medics with rifles slung over their shoulders. They were able to ascertain that she was suffering from a high fever and gave the mother some much-needed medication. Then mother and infant were escorted by heavily-armed combat troops back to the Syrian warzone. Diagnosing the bone disorder would have to wait. ‘I wouldn’t say that Israel is doing this for nothing,’ said Chris Doyle, Director of the Council for Arab-British Understanding. ‘If so, it wouldn’t be publicising it. An Israeli Government spokesman rejected these claims as ‘absurd’. 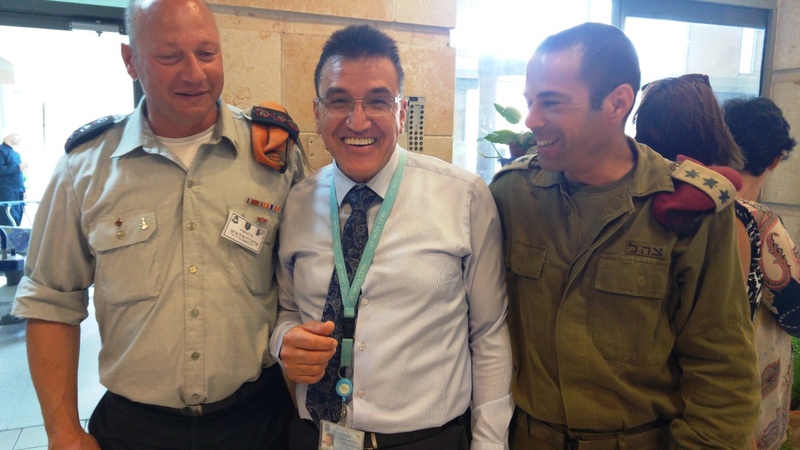 ‘Israel is a world leader in providing humanitarian assistance, both in the Middle East and around the world,’ he said. He also pointed out that this is not the first time the Jewish State has given medical care to those bent on its destruction and their families. In October, a Tel Aviv hospital treated Palestinian President Mahmoud Abbas’ brother-in-law, and last year it treated the daughter of the Hamas leader Ismail Haniyeh. But analysts maintain that in the ‘tough neighbourhood’ of the Middle East, it is rare to give something for nothing.